On an exhale, fold forward at your hips. Place your L hand on the back of your R ankle. Place your R palm on the floor next to your R foot. Rest your chin and chest on your R knee or shin. Lift your L leg as high as possible. Engage your quadriceps and tighten your kneecaps to keep your legs straight and strong. Your L leg will attempt to externally rotate so that your knee and toes point to the side; attempt to minimize this. Remain in the pose for about 20 seconds with even breathing. Iyengar has less external rotation in his lifted leg than I. 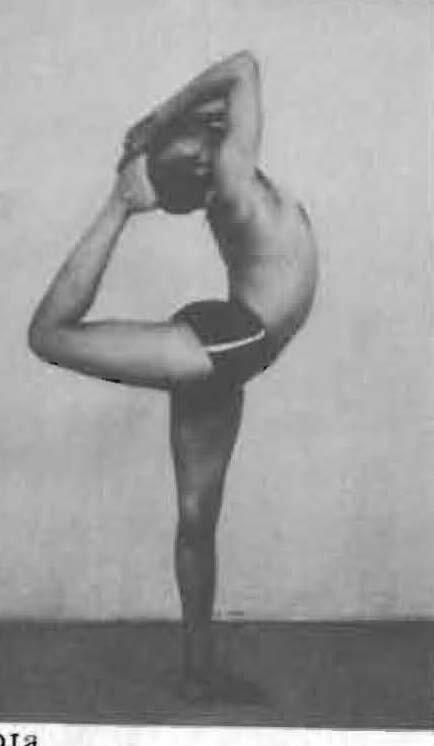 Like most other forward folding poses, Iyengar's legs are straighter than mine. At the time of this shoot, I would microbend my knees to avoid hyperextension and inflammation in the posterior knee capsule and popliteus muscle. My weight is further forward on my foot, which has allowed me to fold deeper over my standing leg. 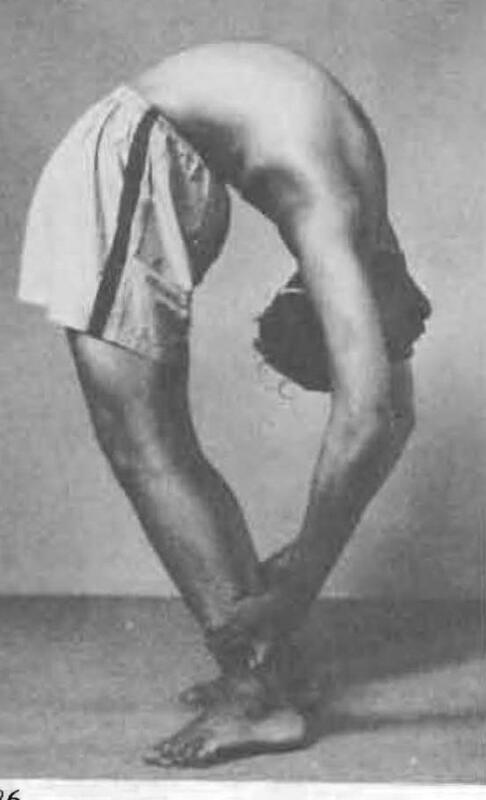 Iyengar is resting his chin on his shin and maintaining a curve in his cervical spine. I am touching my forehead to my shin and flattening my cervical spine. Neither is necessarily wrong, but in general, I tend to think maintaining that curve - as Iyengar is doing - is a better bet. Stand in Tadasana. Separate your feet about 1 foot. On an exhale, fold forward at your hips. Without bending your knees, place your hands under your feet with your palms facing up and touching your soles. Lift your head and stretch your spine into extension - a concave, backbend-like position. 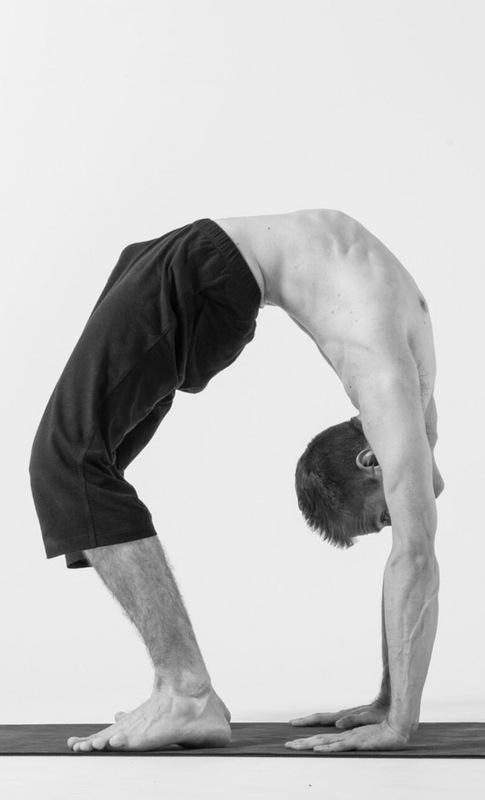 Originate this backbend from the tailbone and emphasize anterior pelvic tilt. With your legs stiff, bend your elbows and fold forward more until your head is between your legs. Leverage yourself into the shape by pulling your palms up into your soles. Breathe evenly for about 20 seconds. Iyengar's legs are truly straight. I have a tiny bend in my knees to avoid hyperextension and pain behind the knee joint. Since this photo was taken, I have learned how to use muscle engagement in the hamstrings and calves to straighten the legs completely with no ill effects. Iyengar is able to fold into this position more deeply than I. His hands are so far beneath his feet that he curls his fingers up and around the outside of his ankles. On an exhale, fold forward at your hips. Hold your big toes between your thumbs and first two fingers, palms facing in towards one another. With your legs stiff, bend your elbows and fold forward more until your head is between your legs. Pull up on your toes but keep them resting on the floor. Iyengar's weight is closer to his heels, which causes his femurs to angle back and his hips to remain behind his midfoot in space. My weight is towards the front of my feet, which keeps my hip sockets directly above my midfoot. Stand in Tadasana. Stretch your chest forward and arch your back. Join your palms behind your back and "draw the shoulders and elbows back." Then turn your wrists and bring your fingertips up to the level of your shoulder blades, as if you were gesturing "namaste" behind your back. Turn to the side and jump your legs apart 3 to 3.5 feet. Turn your hips and chest 90 degrees to the R. Turn your R foot out 90 degrees and L foot and leg 75 or 80 degrees to the R. Keep your legs stretched strong and "throw the head back." Fold forward and rest your head on your R knee. Stretch your spine longer and longer so that your nose, then lips, then chin touch your R shin. "Tighten both legs by pulling the knee-caps up." In other words, engage your quadriceps. Stay here for 20-30 seconds. Then, remaining in a folded position, swing your head and chest around to your L leg. At the same time, turn your L foot out 90 degrees and your R foot and leg in 75 to 80 degrees, so that you are in the full pose on the other side. Now lift your chest and head upright and into a big backbend. Do everything in step 7 on one inhalation (good luck)! Fold forward and repeat the instructions listed in steps 5-6, only this time on the other side. Swing your chest and head back around as in step 7, then return to Tadasana. 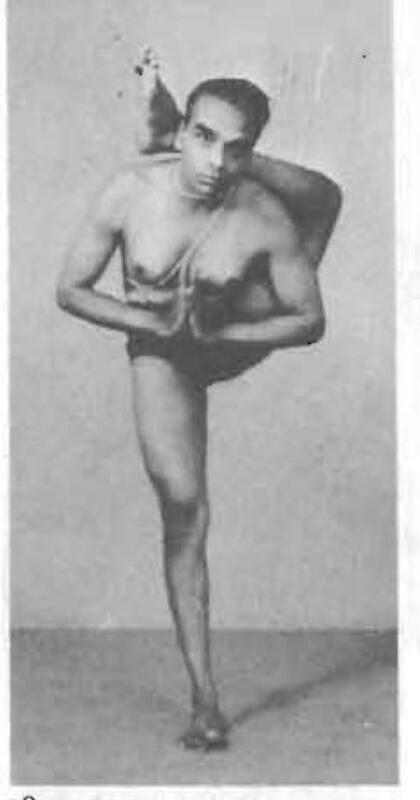 Iyengar's forearms are resting against his back. My forearms are several inches away from my back. This is either because my wrists are much less elastic than Mr. Iyengar's, or he is being less diligent about keeping his palms pressed together than I am. From the photo, it's difficult to tell. 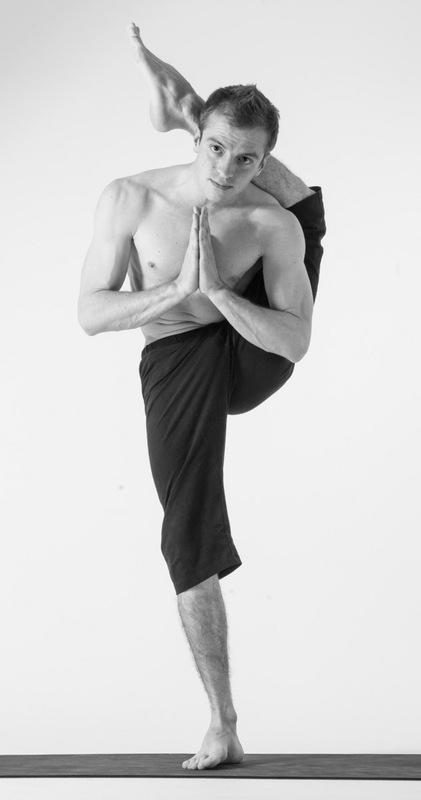 Assume the final form of Virabhadrasana 1 with the R leg forward. Bend forward and rest your chest on your R thigh. Keep your arms straight and palms together. Take two breaths. On an exhale, simultaneously lift your L leg and push down to straighten your R leg, "making it stiff as a poker." Turn your L leg inward so that the front of your thigh is faces straight towards the floor. "While balancing, the whole body (except the right leg) is to be kept parallel to the floor. The right leg, which should be fully stretched and stiff, should be kept perpendicular to the floor. Pull the back of the right thigh and stretch the arms and the left leg as if two persons are pulling you from either end." Hold for 20-30 seconds, then return to Virabhadrasana I.
Iyengar's toes on the back leg are flaring strongly. I'm pointing my toes. I play with both depending upon the day, but I find that pointing my toes often gives me a little more power and control in my quadriceps muscles. Look at that pose! From where I stand, this image of Iyengar in Warrior 1 is among the most striking photographs in Light On Yoga. It's also one of my favorite postures to practice. And yet, for many students it seems to be a painful, inaccessible mystery: it hurts their low backs, it tweaks their hips or knees, and it seems impossible to go deep... might as well just do a lunge with the back heel up, right? To square the hips in Virabhadrasana 1, most students (including myself) try to bring the hip point of the back leg forward and inward. This action tends to cut off the stretch and energy flow through the back leg, like a kink in a garden hose. That action may also torque the knee by forcing the thigh to internally rotate while the shin externally rotates to keep the heel on the ground. What to do? Most students simply shorten their stance. This might make the hips easier to square and solve the torque problem, but in my experience, it may irritate the low back and diminish some of the strengthening and energetic benefits of the posture. Iyengar doesn't say anything about square hips. He does say to “stretch out the (back) leg and tighten at the knee.” When I begin focusing on this stretching action and stop obsessing over perfectly square hips, Warrior 1 blossoms. When I teach the pose nowadays, I encourage my classes to keep the pelvis roughly square, yet emphasize stretching out and externally rotating the back femur in its socket. Given these instructions, students report all sorts of breakthroughs: no more back and knee pain, lovely opening in the psoas and hip flexors, deeper access to breath through the chest, and much more. Don't get me wrong; I'm not advocating getting all sloppy and loose in Warrior 1. I've simply stopped caring whether my hips are truly square... and started focusing on creating a powerful, steady arc that moves from an open position (in the outside edge of my back foot) to a forward-facing position (in my upper chest). Some teachers and yoga therapists might be squawking right now. “But your SI joints!” they're saying. I'm not a prescriptive sort of instructor. I suggest certain alignment principles not because I think I'm objectively "right," but rather because I believe these cues may give you access to new sensations, ideas and sources of strength and ease. I've found overwhelming success with this form in my own practice and teaching. For me – right now – practicing Warrior 1 this way is “better.” But if you think this version of Virabhadrasana 1 doesn't suit you or your students, more power to you. Experiment and find your own answers! That's all I'm doing. And that's what this is really about. I'm not interested in “rules” in yoga. My experience tells me that the only constant in my life is change, and that's why I'm interested in discernment. I'm interested in figuring out what works – what empowers – what transmits. Expand your chest and open your upper spine with postures like Adho Mukha Svanasana (Downward-facing Dog Pose), Paryankasana (Couch Pose), and Urdhva Dhanurasana (Upward Bow Pose). Okay, this pose prepares you for nearly everything. Attempting the shapes of yoga poses (and nothing more) can provide a great deal of benefit to lots of people. But my style as a practitioner and teacher is all about going deeper than that (eventually). It's about engaging subtler actions, discovering different nuances and methods. I believe that practicing the shapes of yoga is body literacy; safely deepening and playing with those shapes is body fluency. And the more fluent we become in the languages of our bodies, the more we can understand them – and make peace with them. With that in mind, Warrior 2 is a great foundational pose where lots of fluency-building work can be done. 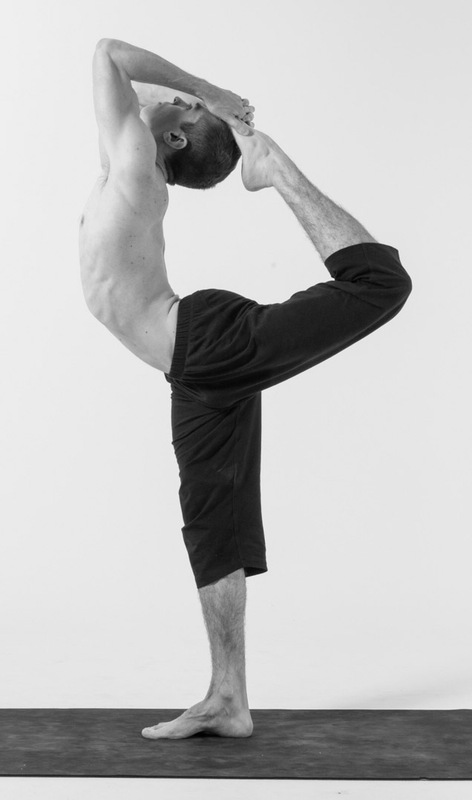 Lately I've been playing with its power as a deep hip opener similar to Baddha Konasana (Bound Angle Pose).